Battlefront: Twilight Company was originally released in November 2015, and written by Alexander Freed. The paperback edition includes the prequel short story “Inbrief” by Janine K. Spendlove. My review of “Inbrief” can be found here. The audiobook was narrated by Jonathan Davis. Looking at the Rebel Alliance it becomes clear how different it is from the Empire. Uniformity. Order. Gone! Many victims bowed to the might of Imperial rule. Slaves! Some survivors of the Empire's destruction bandaged together. They formed cells of resistance. Joining other rebel cells to increase their might. Each cell pumping blood into the mammoth of defiance. Against oppression. Full of hope. Because the Empire had such deep tendrils in the former infrastructure of the forgotten Republic, the Rebellion had to fight tooth and nail to piece together scraps of bygone wars to fuel their artillery. Though it took many years to scavenge, the Rebel Alliance finally put together a massive fighting force to wage an offensive campaign against the Empire. The tale of this novel is about the rebel cell Twilight Company during the last few months of their first major offensive campaign. Sergeant Hazram Namir leads the ground soldiers of Twilight Company. Namir was a child soldier from Crucival, who went from one war to the next. Too young for the Clone War, but old enough to be sucked into the Galactic Civil War. The narrative mostly focuses on him, and his interactions, with the soldiers of Twilight Company. He did not train to become a soldier. He grew up as one. In addition, the world of Crucival was not as advanced as most worlds. Technological understanding escaped Namir. Applying a real life comparison would be to take a child from the 1970s, refusing them access to anything electronic, and then bombarding them in 2016, with everything at once (cell phones, wi-fi, tablets, etc). It would all seem like magical gobbledygook! But that is what makes Namir special. He may not know much in the way of technology or civilian life, but he has instincts for adapting to a warzone. Skills in reading people. Training fresh meat to live long enough to survive. In the novel, Namir interacts with many soldiers. Too many. He doesn't always remember their names, but that is the ebb and flow of war. Brand was a former bounty hunter, who joined Twilight Company. Though part of her back story was revealed in Twilight Company, the fulcrum moment of her decision was revealed in the short story “Inbrief.” What makes her character special is her thorough determination to keep Twilight Company alive. She might not be one to socialize, but she does tend to the needs of her rebel cell, and prune out the thorns. Governor Evari Chalis was a lieutenant to Count Vidian. To gain more insight into Chalis it helps to first read “Bottleneck” short story and A New Dawn by John Jackson Miller. In those stories, the antagonist Count Vidian is highlighted and he was the one that trained her in the Empire. It isn't necessary to read those stories to understand Chalis, but it does add another to her character. A sculpture by hobby, and a logistics advisor by profession, Chalis enters Twilight Company’s campaign as a way to escape the Imperial noose hung around her neck by the rebel’s invasion of Haidoral Prime. A smart woman, who has so much to offer to the rebellion… If she can be trusted. What makes her character special is how cunning, manipulative, and mysterious her motivations are, as the plot unfolds. Prelate Verge and Captain Tabor aboard the Star Destroyer Herald are tasked, with hunting down the defected Evari Chalis. In a sort of yin and yang, this pairing offers a combustible bond. Where the Prelate Verge was a young, psychopathic worshipper of the Emperor (full of entitlement), Captain Tabor was an old, respected naval instructor. Two separate generations. Two completely different mindsets full of total loyalty to the Empire. Their inclusion in the story falls more on the lighter side, but play a pivotal role in the hunt for Chalis. Thara Nyende aka SP-475 was a newish graduate of the Imperial Academy stationed on the planet Sullust. As a Stormtrooper she did her duty to the Empire, and keep her town of Pinyumb safe. On her off-duty hours, she brought her Uncle relief supplies to the struggling miners faced, with the growing production demands of the Empire. The beauty of Nyende’s character is how the reader got to experience the Empire's occupation through her eyes. Her justifications to the events that unfold in her story arc. Not one side is ever fully evil or good. Everyone is a shade of gray from the fallen ashes of the casualties in this star war. The approach of the narrative is a mix of two storytelling styles. The majority of the novel is written as a ground soldier’s journal through an entire campaign. This approach was very engrossing as it allowed the reader to experience micro-moments of battles that stood out to the characters in the story. Moments that go from heartwarming to gutwrenching. The details of those moments burned into memory as Twilight Company struggled to endure. To survive. This approach did allow, for a longer story arc in a condensed story. For example, it would be like if you took a season of The Clone Wars TV show, and extrapolated the main story beats and personal moments and put them into a novel. The other approach to the narrative was the traditional fiction style of writing. The novel does jump around a lot in the timeline. At first, it was confusing why it was approached that way until I got into later parts of the story. There are 4 parts to the story: Withdrawal, Regroupment, Assault, and Siege. On my second time reading the novel the flow felt a lot smoother since I understood how each part fit together. Some might find it off-putting; however, to me, it added this layer of excavation into the story as I tried to put together the connections in each part. 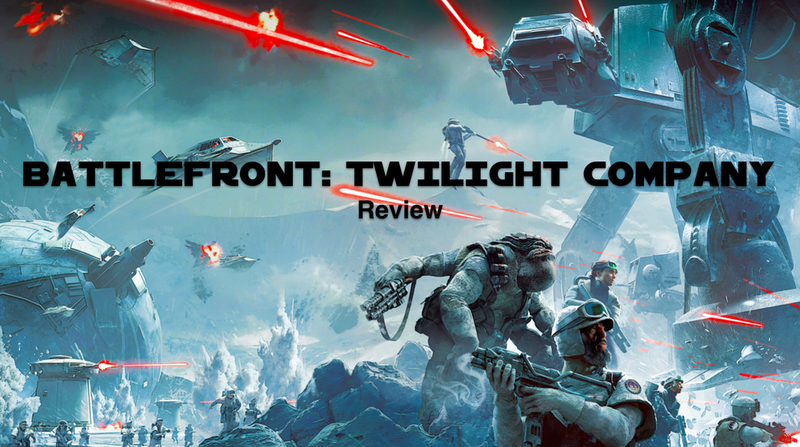 Going into Battlefront: Twilight Company I was excited to see how Freed would translate the story of a multiplayer game into a compelling narrative. I was not prepared, for how gripping the narrative would be! Something really interesting I noticed and enjoyed was the limit to preexisting characters. Sure, we get references to some of the main cast of the original trilogy, but only two make an appearance. Of the two, one only says three words, and the other is never officially named… And they were amazing moments! Freed did a marvelous job of making all the characters feel like they belonged in the universe of Star Wars. In addition, I enjoyed how the narrative had a lot more female roles on both sides of the war. I enjoyed how much the novel added to the seriousness of war. The scar it left across the galaxy. The ending was definitely satisfying, and I hope to see characters of this novel return in future stories!